Thoughts of connection was heated up. Japan Media Arts Festival calls for entries in four divisions; art, entertainment, animation and manga, from all over the world and gives winning artists the opportunity to exhibit their work. Despite our worries about a fall of entries because of 3.11 and the nuclear disaster, there were more submissions than last year, with 2,714 high-quality art works submitted from 49 countries.The award-winning works are exhibited at the National Art Center and satellite venues; Tokyo Midtown d-labo, Mercedes-Benz Connection, Nicofarre, and TOHO cinemas Roppongi Hills. The award-winning works were selected by spirited member of juries including Mamoru Oshii, Sheigeo Goto, Gabin Ito, and Keiko Takemiya. “Que voz feio” by Yoshihiro Yamamoto received the grand prize in the art division. 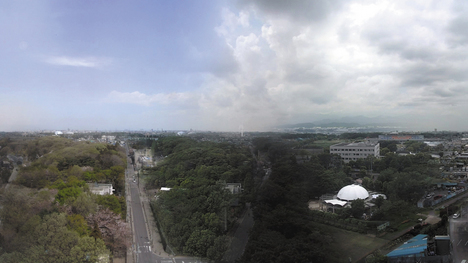 Yamamoto is currently enrolled in the graduate program for the intermedia art at Tokyo University of the Arts. 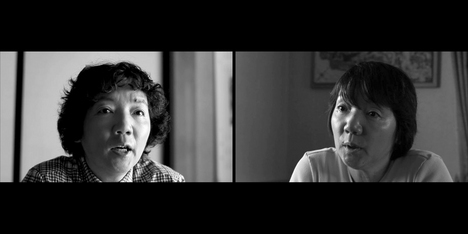 The screen shows twin sisters in separate frames. In a relaxed manner, they each talk about an incident that occurred in their childhood in Portuguese. Yamamoto wanted to give the awareness of changing through the multiplex film using images, sounds and subtitles. However, as the film goes on, the meaning of their words and the chronological order become uncertain. Who is the person concerned? Is this a documentary or fictional? Is the time going forward or backward? These questions filled my head and I was unable to catch up guessing. Moreover, each incoherent story link together from time to time and it brings more confusion to the viewers. Then, as it hits the greatest common divisor, the film ends suddenly. Some viewers stay at the exhibition space to see it again, and some leave with unassimilated feeling. This work made me feel that I was outwitted but, at the same time, made me happy to meet a new way of art. 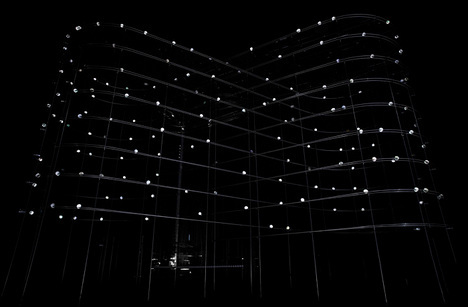 Light installation “Particles” by Daito Manabe and Motoi Ishibashi received the excellence award in the art division. As soon as I entered the exhibition space, I was overwhelmed by the floating lights and synchronized sound. The balls with built-in LED, which is controlled to radiate in specific timing, roll down on the eight-shaped endless track. I devoted myself to the light and sound till I noticed the stiffness in my neck. The staff at the exhibition space told me that he was attracted by the depth of this work more and more as he kept watching the work. It sounds like a testimony to prove that technology shifted to art. In Zen, there is a concept of time called “live life now”. I could have the Zen-like feeling from this work. This work shows the true charm of media art which makes the thought and sense of artists visible. Yoshiyuki Katayama wanted to see the turn of the seasons. He turned his curiosity into his work “Tsunagaru-TENKI” and received the excellence award in the art division. After studying film at the department of cinema at Nihon University College of Art, Katayama became a freelance film designer. In 2010, he started the original project “Tsunagaru-TENKI”. It is a website which presents a single video with a year’s worth of pictures of sky and a daily blog video with animations. Katayama said “I want to show a different view of our everyday life by connecting our ordinary days and scenes.” It is impressive to see his attitude taking care of something between his work and private life. Other award-winning works in the art division are “BLA BLA” by Vincent Morisset, “Monkey Business” by Ralph Kistler and Jan Sieber, and “Senseless Drawing Bot” by So Kanno and Takahiro Yamaguchi. 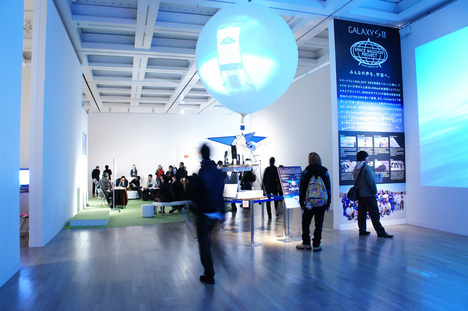 “SPACE BALLOON PROJECT” received the grand prize in the entertainment division. The team, created by Tsubasa Oyagi, Kampei Baba, Takeshi Nozoe amd John Powell (CEO at the JP AEROSPACE), attached a GALAXY SII smart phone to a balloon and let it fly 30000m into the stratosphere above the state of Nevada in the US. The scenes from the flight were broadcasted on USTREAM. 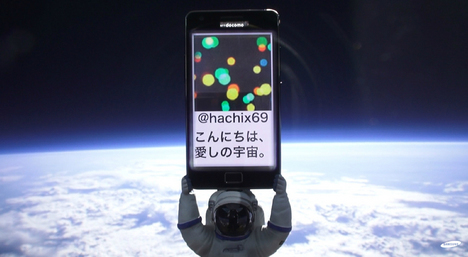 During the flight, the screen of the smart phone showed the “message to the space” which is submitted by Twitter. We could see the video which was broadcasted in last July on the website along with the Open Reel Ensemble by Ei Wada (he received the grand prize in the art division in the 13th Japan Media Arts Festival) and musics by Masaktsu Takagi and Miu Sakamoto. 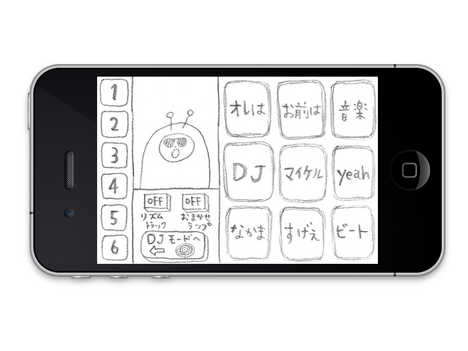 Tsubasa Naruse’s iPhone app character “Rhythmushi” received the new face award in the entertainment division. The users play with the turntable on the touch-panel and can enjoy being a DJ. As a result of this uniqueness, it has become a popular app. Naruse studied at the Kunitachi College of Music and is currently enrolled in the graduate program at Tama Art University, where he is active in the fields of sound and media art. It reflected a recent trend that one student managed all from programming to illustration and became popular. Moreover, a sketch-on-the- notebook-like simple illustration shows a certain spirit of entertainment. Besides “Rhythmushi,” Yuichiro Katsumoto’s “Phase Transition-ish Apparatus” and Facebook’s popular app “The Museum of Me” received the excellence award in the entertainment division. The new face award went to “Hietsuki Bushi” by “Omodaka”, an experimental project to blend techno folk songs with motion graphics. The animation by Ryo Hirano drew the viewers into their peculiar world. “Puella Magi Madoka Magica”, which is known as a post-Evangelion TV animation, received the grand prize in the animation division. The artist is a popular animation director, Akiyuki Shimbo, who created “Bakemonogatari”, “Sayonara, Zetsubo-Sensei”, and “Arakawa Under the Bridge”. Even though the animation has a common theme of the “magical girl”, it has become popular and created a peculiar boom as a midnight TV program. The thrilling story-development and the potential criticism behind the work attract not only animation enthusiasts but also people in various cultural fields. The excellence prize-winning work in the animation division includes “Legend of the Millennium Dragon” by Hirotsugu Kawasaki, “A Letter to Momo” by Hiroyuki Okiura, and “Folksongs & Ballads” by Mathieu Vernerie/Pauline Defachelles/Remy Paul. In manga division, Hisae Iwaoka’s “Saturn Apartment” received the grand prize. Iwaoka depicted a boy who lives in out-of-Earth colony in this manga. Moreover, Paco Roca’s “Arrugas/el Faro” and Alison Bechdel’s “Fun Home – A Family Tragicomic” received the first excellence award as a foreign comic book. 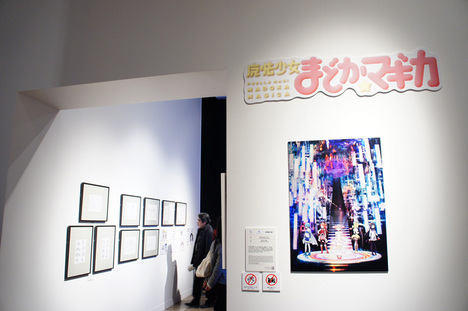 Kotobuki Shiriagari’s “Manga after 3.11” also received the excellence award. It depicted the Shiriagari’s experience of having visited the disaster-stricken area as a volunteer and it is published every day after 3.11 in Asahi Shimbun. 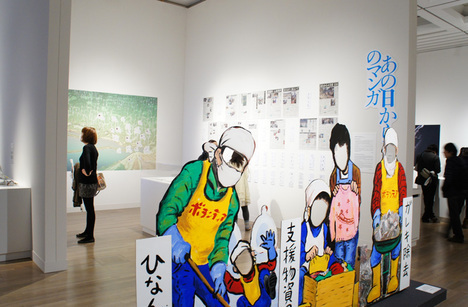 Shiriagari carried out his philosophy of seeing everyday life with his unique humor even after the earthquake disaster. The picture shot by Niklas Roy’s “Electronic Instant Camera”. 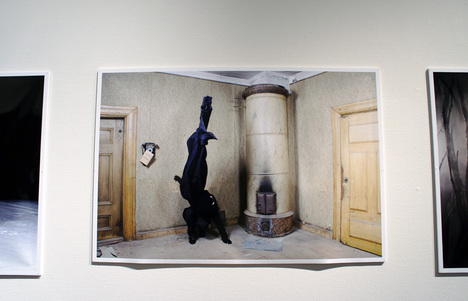 Niklas Roy’s “Electronic instant Camera” was selected for the art division jury recommended work and won popularity as a participation-style media art. The camera is a combination of an analog black & white videocamera and a thermal receipt printer. 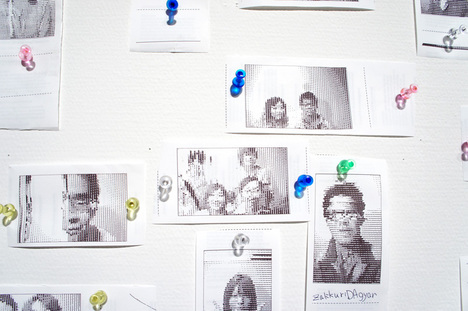 Visitors stay still for 3 minutes in front of camera till the camera spits out the photos printed on the receipt paper. This work has a harmony of low and high technologies and is playful. Sayoko Kinoshita, who established the first Hiroshima International Film Festival and has been exerting herself for the festival, received the special achievement prize. In addition, the jury committee has recommended works of Ville Anderson, Boaz Aharonovitch, Taisuke Koyama, Norihito Ogata, SHIMURABROS., Marguerita Humeau, YKBX, Masahiko Saito + EUPHRATES. The festival also offered some related events and programs including talks by award-winners, symposiums and workshops. At the theme symposia “Media Art in the Age of Massive Data Flow” on February 29th, Takashi Ikegami (researcher/artist), Minoru Hatanaka (NTT Intercommunication Center Chief Curator), Koichiro Eto (Media artist) and Shigeo Goto had a lively discussion about what art should be in the age of massive data flow. During the topic of how to use data in art, Ikagami gave an important opinion while talking about the data at the Tohoku earthquake. I think that this years’s festival turned a spotlight on the artists who had the deeper notion about the importance of “individual” as Ikegami mentioned. I saw more works based on the principle of communication and could feel the warmth of humanity through the exhibition. Also, from the increasing international entries, the work which is poetic and make us rethink of humanity was selected for the awards. I believe that it makes this media art festival focus on the human race as a mediation. This years’s work tend to carry the atmosphere of healing and lyricism. What we need for next year is to regain the vitality. As the number of entries grows every year, lots of work with “individuality” will be gathered for next year’s Japan Media Arts Festival. Satellite venues; Tokyo Midtown d-labo, Mercedes-Benz Connection, Nicofarre, and TOHO cinemas Roppongi Hills.